The last time I talked to Oppo I asked you guys if I should buy a Civic or a Jetta with a $9,000 budget. At the bottom of that post I said I was also looking for a Mazda 3, but had difficulties finding a decent one. I looked at online car marketplace websites like autotrader and cargurus for hours & ran about 20-30 carfax reports, and I really couldn’t find a clear winner. Then this car hit the market. It was black, it was a hatchback, and it had only 71,000 miles. 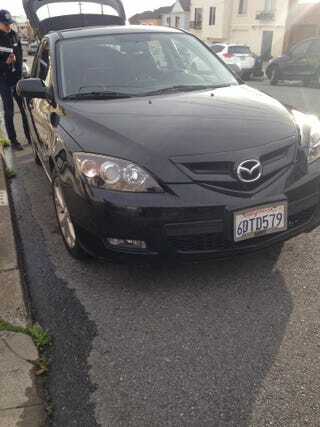 Unlike every other mazda 3 hatchback in my price range, it didn’t have a salvage title or a high miles. The “dealer” (who I’ll talk about in a minute) did post pictures of wear and tear on the car, and there were scratches on almost every panel of the car. For many people this would be an issue, however, living in San Francisco means that your vehicle is going to get plenty of scratches on it, and 100% of those scratches are caused by people who hit your car while parking. This car will never be as fuel efficient as a Civic, and a Jetta feels more solid, but at the end of the day that didn’t give me buyer’s remorse. My previous car was a 2000 Nissan Pathfinder, and while I love it to death, it just wasn’t the right car for the city. My Mazda 3 is easier to park, It won’t guzzle gas, and I get to have a car that’s actually fun to drive. It’s not just marketing! The 2008 mazda 3 hatchback feel like a big miata on twisty roads. Now for the buying experience: I purchased this car for $8,860 through a company called shift. Shift acts as service that delivers test drives to car buyers. Originally my parents were going to purchase the car for me on last saturday, but a family emergency happened and we needed to expedite the buying process. I test drove the car on wednesday and my parents signed the papers on thursday. Between both days, the entire process took less than 2 hours. They said for most customers, transactions can take only one hour. I have a 7 day/250 mile return policy, which as of right now I don’t think I’ll be using. If you’re in Los Angeles or the SF bay area, check them out...and no, I did not get paid nor did I get a discount on the car for writing this last paragraph. Am I gonna modify it? Maybe. Am I afraid of rust? Sorta. I live near the ocean so I’m concerned that the air might oxidize the metal. I know that in the northeast and Canada mazda 3's like mine rust out prematurely. But there’s no rust on the car as of now, and the carfax shows that it’s been a california car for all of it’s life. How long am I gonna keep it? until I can afford a used Lexus IS350 F sport. What’s going to happen to my old car? My old pathfinder is going to stay in the family. We purchased it new on January 1st, 2000 and there’s too much sentimental value in the car. I grew up in the back seat, it was my first car, and it still runs well. Not driving that pathfinder anymore feels like breaking up with a girlfriend I still have feelings for, but driving my Mazda 3 feels like being in a new relationship with a girlfriend who’s way more fun and better in many ways. Last but not least: Thank you Mom and Dad!